So I'm sure I'm not the only one who buys/receives products and even though you were so excited to get your hands on them apart from a quick swatch of them for a blogpost you have yet to actually try them on your face. While tidying my makeup collection I've realised that a few of the things I've gotten in the past 2 months I've still yet to actually use. Sleek iDivine Original Eyeshadow Palette: My local Boots doesn't stock Sleek sadly so when I seen this palette in a local pharmacy I just grabbed it, I probably paid double the price of what it's actually worth but because I couldn't get it in Boots I just had to pick it up. The colours are all gorgeous but I just have yet to actually pick it up and use it, I don't even think I've swatched it yet. 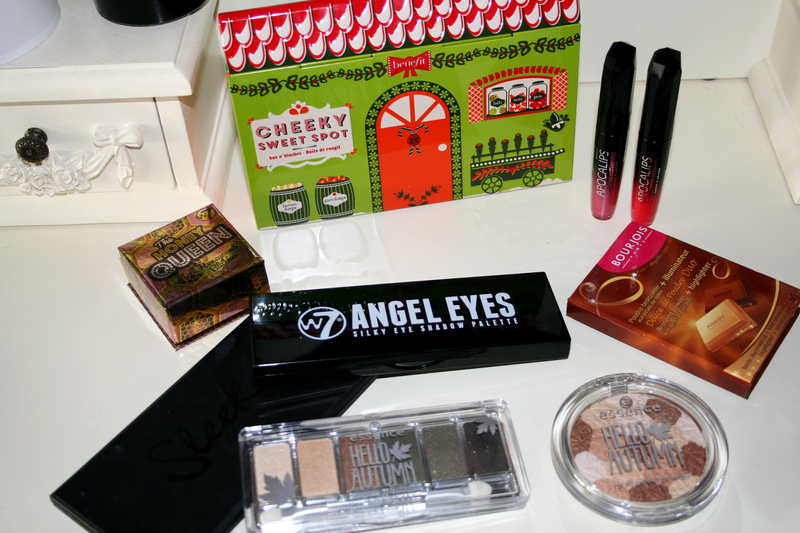 Essence Hello Autumn in 01 Walk In The Park: When I seen the Autumn collection of Essence products I knew I wanted to pick up something from the range to try and yet I have yet to touch this palette. 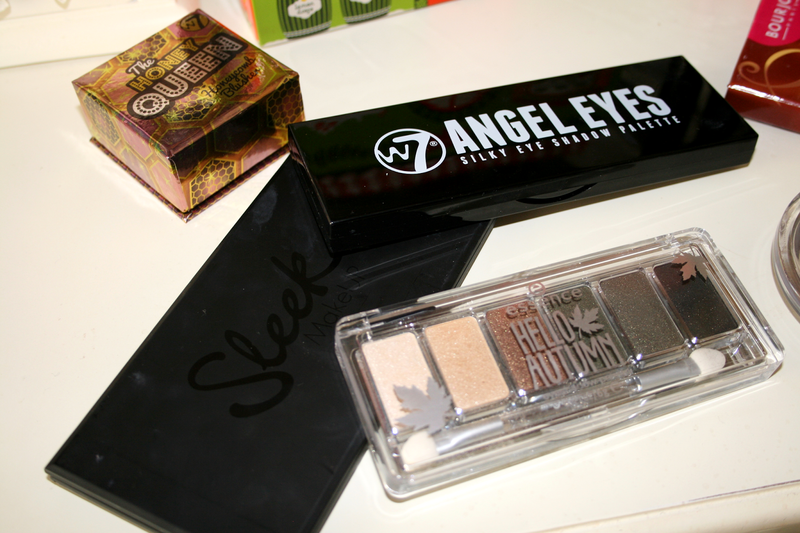 W7 Angel Eyes: I received this as part of a prize package and the colours are great for neutral eyes but again I just have yet to actually try it. I think my problem is I just stick with what I know and so my typical makeup stays the same for a long time. W7 The Honey Queen Blush: Again this was part of the prize package but again I've just been sticking to what I know and I actually really like the look of this blush and think it would look gorgeous on the skin. Benefit Cheeky Sweet Spot: Something I actually did pay double the price for because customs loves ruining my happiness, when I seen this start to pop up I was straight online to order one for myself as I didn't want to wait till christmas incase you couldn't get your hands on it. Another reason why I wanted to get it was I wanted to try Hoola out and see what was the big craze about it and this was the same price as just getting Hoola on it's own so I thought why not and this way I'd get more blushes to try. I've tried Hoola out once since getting this and haven't touched any of the blushes or highlighter. Why? I really don't know. Apocalips in 300 Out Of This World & 501 Stellar: I love the Apocalips formulas I think they're great. They have great pigmentation and they're long lasting. However I didn't realise how many of these I actually owned and found these two at the bottom of my drawer. The colours are gorgeous, however they aren't exactly the kind of colours I wear at this time of the year as they're more a spring/summer kind of colour. Essence Hello Autumn Multi Colour Powder: Again something I picked from the Autumn range, what made me pick this up was the leaf design on the actual product. However I'm not going to lie I don't even know what this is, they say it's a face powder but do I use it like a bronzer or face powder? It's very shimmery and very light in colour so it really confuses me not going to lie. 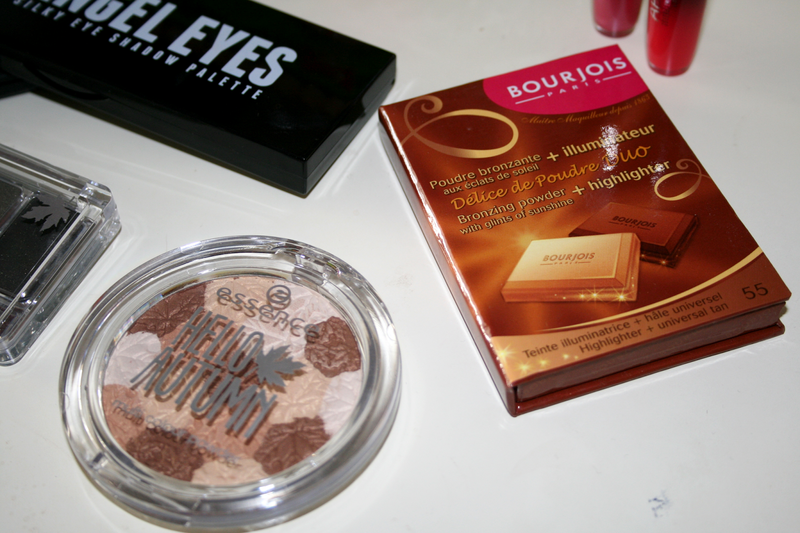 Bourjois Bronzing Powder and Highlighter: When my local boots started stocking Bourjois I almost screamed because I wanted to get my hands on this product so badly. Yet again I've yet to actually wear this product, I have swatched it but thats about as far as using it I've done. I have been good these past few weeks and haven't went near Boots so I haven't bought any beauty products recently, but I have challenged myself to do a full face of makeup and start using the products mentioned above. Have you any products you've bought and have yet to actually use? You're not alone in this. LOL! My bathroom is littered with makeup that I have yet to touch or used only once, it's terrible. Dallas and Bella Bamba are gorgeous blush shades by Benefit, you must try them out soon! I lovveee the Apocalips, they are awesome! Must pick up some more as I lost my only one! Nice products - I have apocolips in matte and really like the formula!